Common Core Math For Parents For Dummies is packed with tools and information to help you promote your child's success in math. The grade-by-grade walk-through brings you up to speed on what your child is learning, and the sample problems and video lessons help you become more involved as you study together. You'll learn how to effectively collaborate with teachers and keep tabs on your child's progress, so minor missteps can be corrected quickly, before your child falls behind. The Common Core was designed to improve college- and career-readiness, and to prepare U.S. students to be more competitive on an international stage when it's time to enter the workforce. This guide shows you how the standards were created, and how they've evolved over time to help ensure your child's future success. The Common Core Math Standards prepare students to do real math in the real world. Many new teaching methods are very different from the way most parents learned math, leading to frustration and confusion as parents find themselves unable to help with homework or explain difficult concepts. This book cuts the confusion and shows you everything you need to know to help your child succeed in math. The Common Core was designed to ensure that every student, regardless of location or background, receives the education they need. Math skills are critical to real-world success, and the new standards reflect that reality in scope and rigorousness. 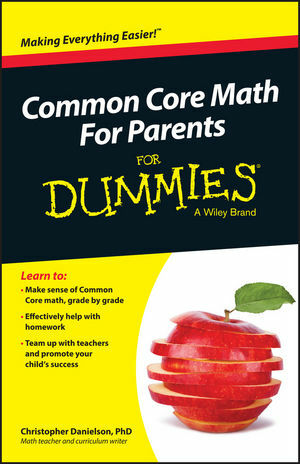 Common Core Math For Parents For Dummies helps you help your child succeed. Christopher Danielson, PhD, is a leading curriculum writer, educator, math blogger, and author interpreting research for parents and teachers across the country from his home base at Normandale Community College in Minnesota.